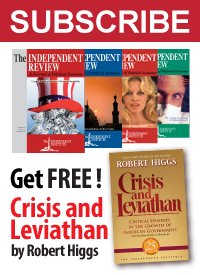 Obama Budget: Runaway Inflation in Health Care Spending? Something is deeply amiss where President Obama’s latest proposed spending for Health Care Services is concerned. Previously, we noted the remarkable growth in the amount of spending that President Obama has proposed for the line item (literally Line 551 of Historical Table 3.2) that includes expenditures for the Medicaid and Affordable Care Act (more popularly known as Obamacare) welfare programs in his Fiscal Year 2017 budget proposal compared to how much he projected would be spent on this same category in his Fiscal Year 2016 budget. But since those dollar amounts represent spending in terms of dollars that have not been adjusted to account for the effect of inflation, we wondered how much of the increase was due to “real” increases in spending as opposed to inflation-driven increases. To find out, we used the nominal and inflation-adjusted revenue and outlay data for the overall federal budget in Historical Table 1.3 of President Obama’s FY 2016 and FY 2017 budget proposals to calculate how much the spending for Health Care Services in both would be after being adjusted for inflation to be in terms of Constant 2009 U.S. dollars. The chart below illustrates what we found. After adjusting both FY 2016 and FY 2017 to be in terms of Constant 2009 U.S. dollars, we see that the amount of “real” spending is nearly identical, with the values for each year from 2016 through 2020 falling within a very narrow margin. But that doesn’t explain why there is such a difference between the projected actual amount of spending for FY 2016 and FY 2017, when expressed in their nominal current year dollar figures. With the inflation-adjusted spending being nearly identical, there aren’t very many ways in which the proposed spending figures for Medicaid and Obamacare could have changed so dramatically from one year’s budget proposal to the next as they did. 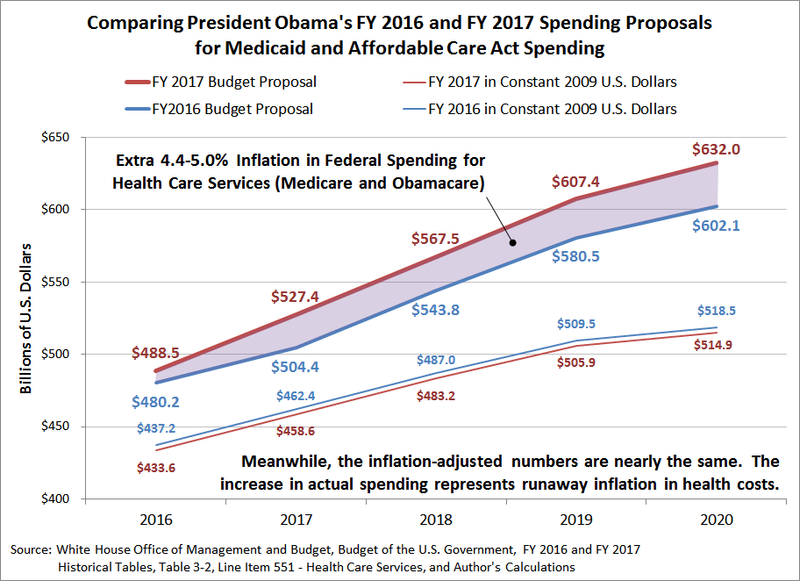 It could be that President Obama completely underestimated how much inflation there would be for these Health Care Services in his FY 2016 budget or perhaps is now completely overestimating how much inflation there will be during these future years in his FY 2017 budget. Or, in a really weird way, it could be that President Obama believes that all the inflation he projects for the future of the U.S. economy will be from health care services. Since spending for Health Care Services for Medicaid and the Affordable Care Act represents the biggest line item spending increase in his FY 2017 budget proposal, it would be nice to know which scenario applies.